The challenge of corporate culture: Start small but get started! How agile teams can quickly and sustainably change the work culture of an entire company – pragmatically and effectively. Digitization is rapidly changing business models and has a strong impact on the entire working world and, above all, corporate culture. Corporate culture has become one of the most sustainable competitive advantages and has risen to top priority on the CEO and leading financial investors’ agenda (1). For employees culture has become the Number One job satisfaction criterion – outranking career and salary (2). 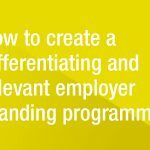 The driving force of corporate culture is a modern and flexible working culture – it is the decisive factor for employee identification and therefore promoting efficiency and innovation. How can culture be managed and changed? Digital change requires new forms of work organization, qualification, collaboration, and employee motivation. Many companies are still reluctant to actively engage with their corporate and work culture – either because of a lack of resources or simply because of the supposed complexity and high costs, associated with an uncertain outcome. Many change programs with traditional methods, such as top-down cascading, linear restructuring or fixation on management have failed. The company’s wider workforce is not reached, resistance or cynicism comes from middle management and opposing positions are provoked. On the other hand, pure bottom-up approaches without the support of the management run into a void and end in frustration. A modern work culture cannot be dictated, it must grow and needs room for initiative and participation. Instead of a classic top-down approach we create individual, decentralized germ cells of change in the company. Within the framework of the corporate strategy, they drive forward concrete change projects in the company’s operating units – agile, experimental, decentralized. Together with management, HR and employee representatives, we define the goals and conditions. We coach the individual guerrilla teams by using different formats tailored to the task at hand. The aim is to create a dynamic pull of change throughout the organization by making the rapid success of others visible. Whether the changes take place on a larger scale or on a local team level, the goal must be to achieve rapid success with visibility and a positive signal effect both internally and externally, which spreads the word and exerts a dynamic pull on the entire organization. Quick wins that result from change suction can be transferred to other teams or projects and thus be implemented quickly and successively into day-to-day business. People are getting involved through a process of participation and identification. Communication is not only a key factor for the dissemination of individual success stories and the acceptance of employees. A well-designed communication program must also ensure that the decentralized initiatives contribute to the values of the company without creating cultural anarchy. Only in this way can we successfully develop the culture of the organization. 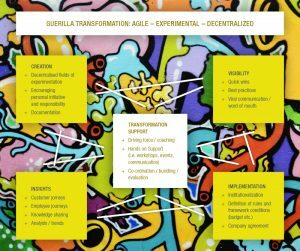 “Guerilla Transformation” stands for the development of tailor-made formats and programs, whether at team, departmental or location level. Our focus is not on the process but on the results: pragmatic successes, agile reactions to change, involvement of a wide variety of stakeholders. We are happy to integrate external studies and experiences, seeking exchange with experts in order to generate new insights and perspectives beyond the worn out trails. Agile learning by doing helps to develop the most promising approaches to rapid implementation. # Internal change process of a leading high-tech company involving various departments and works council representatives. Creation of mission statement, values, leadership and feedback culture, internal communication campaign. Would you like to receive detailed information on guerrilla transformation? Are you interested to learn more about it, using concrete examples?